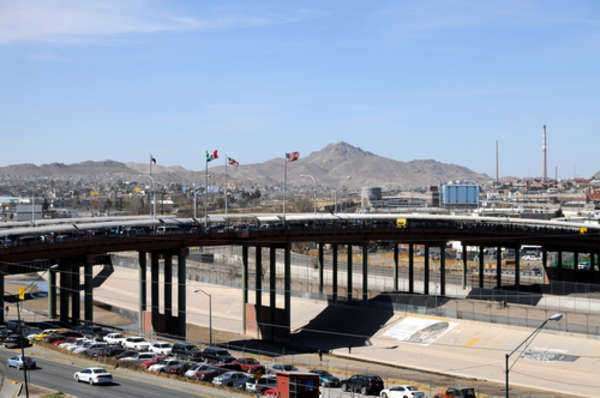 Due to its vastness in size, the border of Mexico and the United States is far too large for the United States Border Patrol to ensure the prevention of all attempts at illegal entry. Logistically, the enormity of this task reigns supreme; said boundary is some 2,000 miles in length, and cameras put in place at border crossings in hopes of allowing everyday people with remote access to the video feed to report unlawful entry have led to little success. Some American citizens, meanwhile, feel the need to take the law into their own hands, and with force. Vigilante border groups have formed as part of grass-roots initiatives to curb illegal immigration to the United States, operating where they believe official border security agents and the federal government has failed. Probably the most prominent of these border groups in the international consciousness is the Minuteman Project, a civilian-led, volunteer operation founded by Jim Gilchrist. The Minuteman Project rose to prominence in 2005 when they announced they would be spending a month in the Arizona desert to help observe border crossings for any signs of illegal activity. As Jim Gilchrist explained, his organization believes in proactive attempts of upholding domestic immigration policy as it is written. In addition, the efficiency of Jim Gilchrist and company did not go unnoticed; they were responsible for the apprehension of several hundred illegal immigrants. But, the way in which they achieved these numbers was decidedly suspect. Numerous cases of stopping suspected illegals at gunpoint were reported, and furthermore, there were no real reliable procedures put in place to screen out members of white supremacist groups. Jim Gilchrist and his followers are not the only vigilante organization that has sprung up in response to the continuing illegal immigration dilemma. Numerous border groups have formed in recent memory to combat what they see as a major to threat to American interests. A majority of these vigilante groups are heavily armed, toting night-vision goggles and rifles. Yet, on a local level, the emergence of border groups may pose a serious threat to the human rights of Mexican immigrants attempting to cross the border of Mexico and the United States illegally; not all of the vigilantes share the same degree of militarily training as Jim Gilchrist, a veteran of the Vietnam War, if any at all. Thus, there is an increased risk that undue assaults and even death will occur from some vigilante pursuits of suspected illegals, as improper knowledge of how to use a firearm only exacerbates the problem overzealousness which has characterized the attempts of some border groups to close in on undocumented immigrants. Moreover, on an international level, purported vigilante justice in the form of violence only stands to hurt relations between Mexico and the United States, when realistically, the two countries must work in concert to treat the underlying causes of illegal immigration.